Compared to March, this month was a hell of a lot better when it came to my motivation and goals. I started the month with a clear intention of pushing my limits during crunch time at the gym, trying to tone up before a wedding out of town. Our weekend in New Hampshire for said wedding was a lot of fun. It had been roughly two months since I had seen Ryan, so it was great to catch up, spend some quality time together and drink our way around the lake region as we hit up some local breweries and wineries. The wedding itself was a blast, besides the flat tire Ryan got as we pulled into the venue, but a quick change of the spare didn’t hinder our fun! After coming back, I decided to listen to my body (for once!) and give myself some time off from the gym since my attention span was starting to suffer in other aspects of my life. The time away from the gym was enough to regain my focus and gear me up for hopefully another successful month. Lose 3-5 pounds: I was really proud of my results I saw in April and I want to keep going, fresh with a new workout program. Head over to my May Workout Split to see more of a thorough breakdown of my goals this month. I’m slowly (but surely) getting get closer to my yearly goal, which I’m still about 25 pounds from and hope that this new program will spearhead my results and get me over the hump. Save up to $200 in piggy bank: Balancing my wallet and making my piggy bank grow was been a lot easier than I thought. I’ve been taking out $140 each paycheck, dedicating $50 to the Europe fund and allowing myself to use that extra $90 as free spending money, stowing away that extra money (if any is left) into the piggy bank next payday. I’m only $32.39 from my goal, which shouldn’t take me long to achieve. Purchase keyboard and start practicing two times a week: After realizing how much I slacked when it came to my Creativity Resolution, I’ve decided to bite the bullet and purchase a keyboard and teach myself the piano! 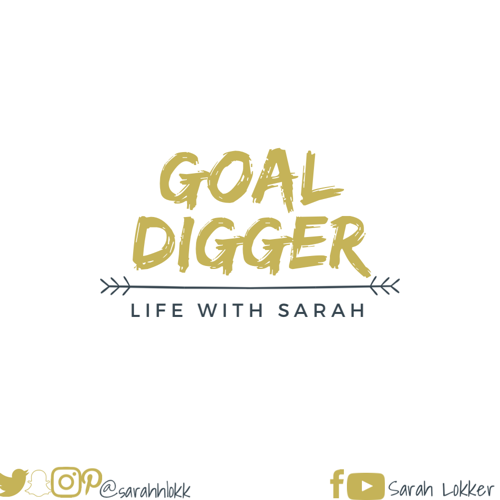 If I put it on my Goal Digger, I’m more likely to actually do it so now it’s time to do my research, purchase a decent keyboard and set aside an hour two times a week. Continue learning German and Dutch: We’re officially 55 days away from our trip and it’s slowly starting to settle in. I’ve been plugging along, learning as much of the basics that I can and want to continue to do so before we jet-set. What are some of your goals for May? Let me know in a comment! This entry was posted in lifestyle and tagged #blogger, ​ bloggers, bbloggers, beauty blog, blog chat, blogger girl, blogger life, blogger lovin, blogger style, blogging, blogging gals, blogging tips, determination, fashion blog, fbloggers, goal digger, goal getter, goals, grind, hustle, inspiration, life with sarah, lifestyle blog, motivation, on the blog, sarah lokker, sarahhlokk, savvy blogging. Bookmark the permalink.